Last weekend I traveled with my friends Dani and Jason up to Huntington, WV to run the Marshall University Marathon. Before heading up there I had every intention of seeing "we are Marshall" the movie about the university and community overcoming a tragedy and finding rebirth. I didn't see the movie... I don't think it impacted my race much because by the time I got to the part of the race route that was on campus I was so cross-eyed in pain that I didn't see much of anything. It was a seven hour drive from my house up to WV. With great company the road trip went by quickly and before I knew it we were in Huntington. The town itself looks like it hasn't had anything new built in the last 20 years. It didn't look bad, just nothing new. Then you get onto campus and EVERYTHING looks new. It's quite a shocking contrast. The old homes around the campus were beautiful and I really enjoyed looking at the architecture. You can tell the university is the center of the town's economy. Registration was super quick and before I knew it, I was holding my race number for my very first open marathon. I expected to feel more nervous, but to be honest I just wasn't. I'd had a cold for the past two weeks and while I was definitely feeling better, I hadn't trained for this race the way I wanted to. In a way this took the pressure off. I had enough long runs in my legs to feel confident about making the distance, and there is just something about knowing you've completed a full distance triathlon that gives you confidence about your endurance that you bring into your following events. I had a goal to qualify for Boston. I wanted to run a 3:45 marathon at FullRev Cedar Point, and save myself from having to run an open marathon. You see, I wasn't really thinking about Boston, more of an idea of running a marathon time that just a few short years ago I would have thought impossible for me. But my marathon at FullRev didn't go as planned, so here I was in WV for redemption. Since I didn't have a bike and swim in front of it, I decided to push myself and shoot for a 3:35 marathon. The original plan was to start at 8:20 pace and go down a few seconds every mile. This is how I have run all of my long runs in the last year, so I guess that is another reason I wasn't nervous. In my head, it was just another long run. Race morning was COLD (27 degrees) which is apparently "perfect marathon weather" according to the runners. ARE THEY NUTS?!?! I dressed in as little clothing as I dared but was seriously over-dressed compared to some. I ended up racing in my Fusion Tri top (it has pockets for my gel flask) under a long sleeve top. 3/4 light tights and my compression socks (so legs ended up being completely covered). I wore an ear warmer and gloves. This ended up being the perfect amount of clothing for me. Around mile 19 my hands got warm and I took my gloves off, but ended up putting them back on around 20 when my hands got cold again. Dani and I lined up together and planned to run the first few miles together... but once the race started I felt really good and she was pretty focused so we drifted apart. I was running what felt like a very very easy pace. The race was completely flat for a large portion of the first half. My pace was around 7:45 but it felt easy and good so I went with it (yep, threw my plan right out the window). Okay, I DID actually think about this for a few seconds before going with it. I decided that I COULD slow down and do what I'd been doing on my long runs and feel comfortable and confident for the entire race. OR I could go for it, see how long I could hold 7:45-7:50 and if I blow up, no big deal, everyone blows up in their first marathon, right?!? So I went for it... the race itself was fairly boring with LONG LONG stretches of straight, flat roads. I listed to the conversations of folks around me to pass the time. Around mile 7 a couple in Newtons ran up beside me and said "nice shoes". They were both wearing Newtons like me :D They were running just a bit faster than me and I noticed from their race number color they were doing the marathon too (the 13.1ers and the 26.2ers started together and the races branch at mile 9); so I latched on to them. Around mile 8 they slowed down so I ran past them. Picked out two ladies in front of me that were running together and tried to slowly reel them in. This is how I passed the time. There is a really pretty section around mile 9 through a park along a stream. Started talking with some fellow runners and settled in with someone around mile 11. We stayed together until around mile 21. I tried to stay with him, and was hoping for a boost from the 1st endurance pre race that I took at mile 20, but I just kept falling down into the well. It was all I could do to keep my legs moving... I'd look at my watch and notice my pace falling off... 8:12, then 8:22, then 8:30 and then I stopped looking. I took my gel flask out at mile 24 just hoping one last time that a little sugar would get me through the last two miles... as I was putting it back into my back pocket it got caught in my overshirt and fell to the ground. I stopped to pick it up and as I bent over I almost fell down. I was doing a fabulous impression of Sian Welch and Wendy Ingraham. A lady running by on her morning jog said "oh honey, I'll get that for you". I think I said "thank you". I was in a daze at the point... just hoping I could make it to the sign that said 25... because if you make it to 25, you just have to make it to 26 right? There was a women (running a much smarter race) just in front of me and I was doing everything I could just to stay within sight of her... finally I see mile 25 (she must have been feeling ready to be done too, because I saw her do a little fist pump, which I have to say, even in my deadened state of mind, made me smile). I've never wanted to walk so badly in a race in my entire life... but I felt like I was racing and I couldn't let anyone else come from behind at this point. I trudged (and I DO MEAN TRUDGED) on. Finally, a turn and it appears the last half mile goes through campus... "well, that will be nice", I think to myself. The race organizers of true zealots of evil... the last half mile is on BRICK WALKWAYS with Fountains that you have to GO AROUND. Are you kidding me!??! I wasn't sure if I could take another step... I just wasn't sure if my legs were going to hold out... and then I saw it... Marshall University Stadium beckoning me home... come on Jill, you can make to the finish line, it's right here! I'm handed a football to carry down the field, and suddenly I can run again! I see Dani (who finished her half hours ago) and Jason (who killed his marathon finishing in 3:21) cheering for me. 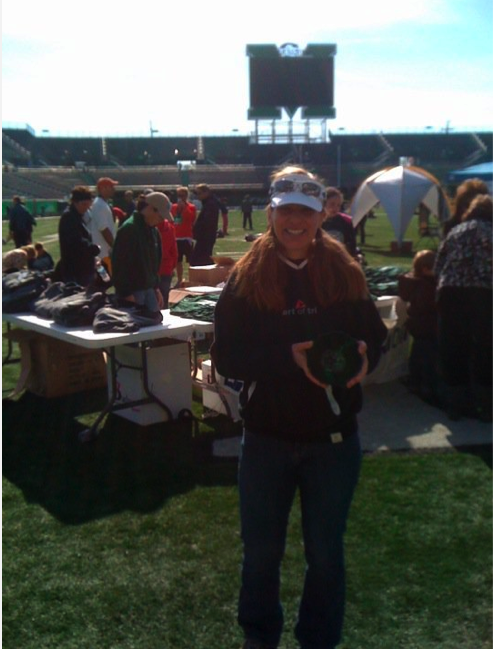 I raise the football over my head and do the hokey pokey across the finish line for my friend Casey. I'm DONE!!! Boston Qualified at 3:32 on the dot! I almost collapse at the finish and when Dani found me I embarrassingly cried all over her while she held me up. But I finished and I was SOOOOOO happy. In the end, I was happy with my race, sure I would have loved to have kept a steady pace until the end, but I think maybe I learned more about myself this way. I've never pushed my muscles that hard before to a breaking point. They were always cramping up, something I always felt was a nutrition issue. This breakdown was more definite, in the sense that as much as I willed myself to continue, they weren't working at the same capacity... I found the point of failure I suppose and pushed on. If I'd run a "smart" race I don't know if I would have gone any faster and now I know that I'm capable of more than I thought, which is quite a strange sensation. Fuel - 1st Endurance Liquid Shot (one "squeeze" ever 4 miles), water on the course, Salt Stick capsule (1 every 6 miles). And if anyone needs a reference point on the Sian Welch/Wendy Ingraham comment, here is the video... it needs no introduction. Wow!! You are amazing!! Congrats on a great finish. Great report and congrats again. It's good to push though like that, shows you have great mental toughness. After watching that video you wonder why anyone would want to do an IM though!